Using the PCB support hardware in hardware pack H117-F, or equivalent, mount the Multi-SR on a flat surface using all six mounting holes for maximum support. To minimize EMI, securely mount the unit on a grounded surface using a metal spacer and hardware at the mounting hole that is surrounded by a conductive pad. Example: 052S4402T15-F = A Multi-SR rated 36 to 75 VDC @ 4 Amps, 40°C MED control temperature setting, temperature sensor based control from two remote temperature sensors, an on-board isolated supply and capability to monitor the speed of five fans. 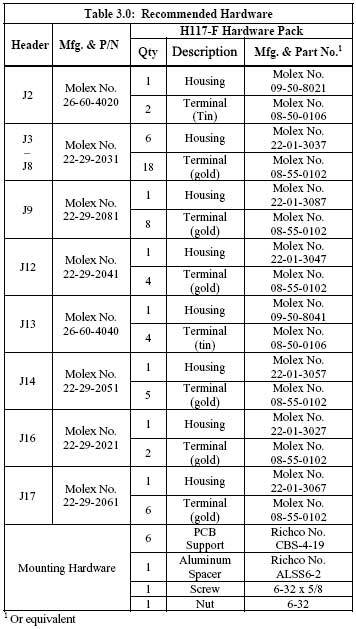 The default configuration of the Multi-SR that is stocked is 052S4401T16-F.
A description of the function of each connector pin and location is listed in Table 2.0. Depending on the model number and configuration of the Multi-SR, some headers may not need to be populated. Use CRI Hardware Pack H117-F containing the following components shown in Table 3.0. Refer to Figure 1.0 for input power wiring. One or two power supplies in the range of 36 to 75 VDC should be connected at header J13. If two power supplies are used, they are logically OR’d on the Multi-SR so that the operating voltage is equal to the higher of the two supplies. The Multi-SR can supply up to 4.0 Amps (still air) and 5.0 Amps (200 LFPM air stream) at 24 VDC or 48 VDC to the fan load. Although it is not required in most applications, an external capacitor (C1) can be installed to provide additional EMI/EMC filtering. Connector J2 is internally connected across the output of the voltage regulator circuitry and in parallel with 960uF of internal filter capacitance. Referring to Figure 1.0, connect an appropriately sized capacitor to header J2. Six Fans: The Multi-SR distributes power to and monitors the tachometer signals from six three-wire fans. Referring to Figure 1.0, connect the fans to headers J3 through J8. Fan wires are usually color coded with red for +, black or blue for – and white or yellow for tachometer signal. Fan current at each fan header must not exceed 2.5 Amps. 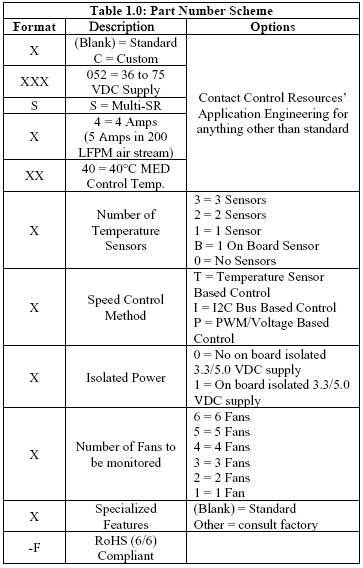 Total current required by the fans connected to the Multi SR must not exceed 4.0 Amps (still air) and 5.0 Amps (200 LFPM air stream) at 24 VDC or 48 VDC. Less than Six Fans: When configured to operate with less than six fans, the Multi-SR is designed to locate the fan headers that have fans connected to them. This means that the position of each fan connection is arbitrary. For instance, when configured for three-fan operation, the three fans can be connected to any three headers, J3-J8. CAUTION: If less or more than the configured amount of fans are connected, a FAN alarm will be activated. Temperature Sensor Connection when I2C or PWM Based Control is used: When configured to operate with either PWM or I2C based speed control, this header is disabled. Therefore, no temperature sensors should be connected to the Multi-SR. Remote Temperature Sensor Control using 3 Sensors: The Multi SR can be configured to operate with a maximum of three remote temperature sensors that are used to provide temperature based fan speed control and alarming. Referring to Figure 1.0, connect the three sensors to header J17. There is no polarity consideration when connecting the sensors. The sensor reading the highest temperature is used for speed control and alarming. Remote Temperature Sensor Control using < 3 Sensors: When configured to operate with less than three remote temperature sensors, the Multi-SR locates the positions that are occupied by the sensor(s), T1, T2 and/or T3. This permits the user to place the one or two sensor(s) at any position. When two sensors are used, the thermistor reading the highest temperature is used for fan control and alarming. CAUTION: If less or more than the configured amount of sensors are connected, a TMP alarm will be activated. On Board Temperature Sensor Control: When configured to operate with an on-board temperature sensor, header J17 is disabled. Speed control is based on the sensor soldered to the Multi-SR.
0-5 VDC or PWM Control Signal: The Multi SR can proportionally control fan speed based on a PWM or 0-5 VDC control signal. Chart 2.0 shows the relationship between the fan voltage and the control signal input. Referring to figure 3.0, connect the voltage signal to header J16. Header J16 is internally pulled up to VCC with a 47.5k resistor. The voltage applied to J16 must be limited to the isolated VCC. The PWM frequency range is 0.1 to 10 kHz. Control Signal Power: If the Multi SR was ordered with the Isolated Power option (see table 1.0), the Multi SR will power this interface. Otherwise, the isolated power must be provided at the VCC & GND pins at header J14 (see figure 3.0). Under Temperature Sensor or I2C based Fan Control: When configured for temperature sensor or I2C based fan control, header J16 is disabled. I2C Bus Speed Command Inputs when Temperature Sensor or PWM/0-5 VDC based Fan Control is used: When configured for temperature sensor or PWM/0-5 VDC based fan control, header J14 will accept I2C Bus speed control inputs but they are ignored by the control circuitry. 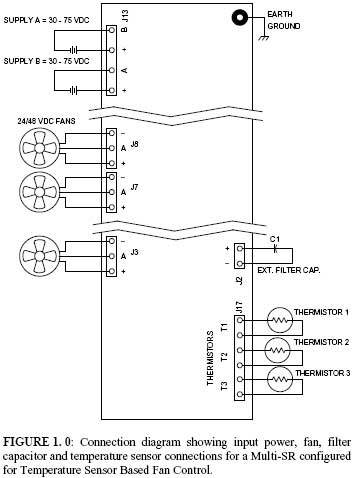 Temperature Sensor and PWM/0-5 VDC based fan control configurations ONLY support I2C alarm status communication. Fan Control and/or Alarm Status Communication on the I2C Bus: The Multi-SR can monitor alarm status and control the fan voltage via an I2C Bus. Referring to Figure 3.0, connect serial clock, data, VCC and ground lines to header J14. VCC: For units that feature an internally isolated 3.3/5.0 VDC supply, no connection to J14:VCC is required; all power for the I2C bus is provided by the Multi-SR. When power for the I2C bus is provided by the Multi-SR, the setting of a jumper at J18 determines 3.3 or 5.0 VDC bus operation. For units that use an external bus power source, connect a 3.3 or 5.0 VDC source to J14:VCC. Header J18 is disabled when external bus power is provided. GND: Two ground reference pins are provided for the I2C bus. Note that the additional ground pin has been provided for the optional connection of a loop back detection circuit. The loop back circuit permits detection of a physically broken connection. Header J9 provides local indication of fan (FAN), temperature sensor (TMP) and watchdog (WD) alarm status. Referring to Figure 3.0, connect alarm LEDs and/or an audible alarm to header J9. All alarm circuits on header J9 are non-isolated from input power (J13). Choose single color LEDs or two leaded, bi-color LEDs with a rated forward voltage (Vf) between 1.6 and 2.4 VDC at a forward current (If) of between 15 and 25 mA. Nominal current applied to the LEDs is 8 mA. The audible alarm output (+AUD-) provides up to 20 mA at 5 VDC and is fused with a 0.062 Amp fuse. Choose an audible alarm rated 100 mW at 5 VDC. Two optically isolated logic circuit outputs are on header J12 to provide remote indication of alarm status. Referring to Figure 3.0, connect logic circuits to header J12. 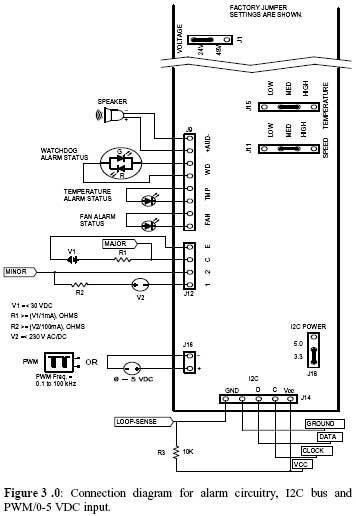 Both alarm outputs must be current limited as shown in Figure 3.0. The output of CE, considered a major alarm indicator, is from an open collector phototransistor. The output of 1-2, considered a minor alarm indicator, is from a MOS relay.